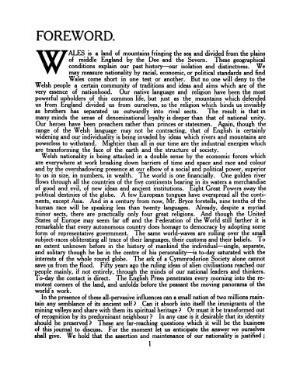 The Welsh outlook: a monthly journal of national social progress was an English-language popular magazine, containing news and commentary and articles on politics, the arts, and education, book reviews and correspondence, with some Welsh poetry. It was published between 1915 and 1933. Publisher Details: The Welsh Outlook Press was founded in Cardiff in 1913 as a publisher devoted to promoting national social progress through a broadly liberal agenda. It owed its creation to Thomas Jones and David Davies. In addition to the magazine Welsh Outlook, it published books relating to Wales. In 1922 it moved to Newtown, and continued to operate there into the 1940s. An account of the history of Welsh Outlook was published in the National Library of Wales Journal XXIV, No. 4 (1986).